I wrote a while ago that I’d done some work in the background to optimise this website for use on your mobile phone – the original post is here. Over the past few months, I’ve received some feedback saying that the site sometimes didn’t display pages as expected. After some investigations, I think those problems should be fixed now. So, if you’ve a “smart phone”, you can create a bookmark for SayNoTo1890.com on your home screen that’ll make it just like an “app”, and it’ll take you straight to the A-Z page listing of companies. More instructions on how to do that are provided here. Following a few requests from users of the site, I have now updated the L page with the geographical alternative for the Liberty Insurance 1890 and 1850 numbers. You can find them here now. I was just alerted to this over the weekend. At the end of January, this website made it into the Irish Daily Star, which you can see here. Irish consumers are needlessly paying out up to €5 a time to call ‘low-cost’ numbers such as those beginning LoCall 1890 or 1850 Callsave — even though they could get the calls for next to nothing. That’s according toSaynoto1890.com. 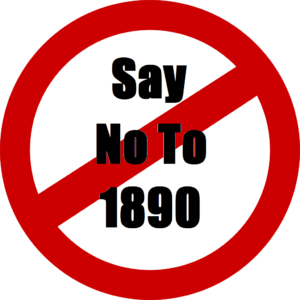 The site points out that popular phone deals with inclusive minutes exclude calls to LoCall 1890 numbers, Callsave 1850 and national 0818 calls from their minute bundles and it provides cheaper alternatives. If you see the website mentioned anywhere else, or if you hear it mentioned on the radio anywhere, please let me know.